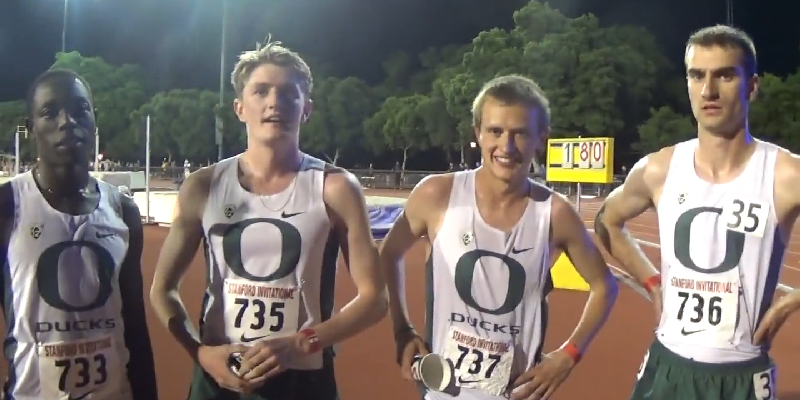 Anyone who watched the Stanford Invitational last weekend may have scratched their heads when they saw the men’s 10,000m race. Among two Ducks lagging in last place for most of the race, were two of the best distance runners in the nation, Edward Cheserek and Eric Jenkins. Just weeks ago, Cheserek and Jenkins brought home four NCAA titles combined. So why didn’t they perform better against the competition in this field? No doubt distance coach, Andy Powell, has his plans. Being a distance runner, especially at the highest of collegiate levels takes a major toll on the body. Many distance runners double in the 5K and the 10K races in a single meet. That is more than nine miles of hard racing within a few hours of each other. Cheserek and Jenkins gave an outstanding effort this past indoor season, so there is no doubt that their bodies were heavily taxed from their performances. If Powell understood this, then why did he schedule them to race the 10K? In the NCAA qualifier, the time to beat for the regional meet is 14:12 in the 5K, but the 10K has only a Finals standard of 28:45 for an automatic berth, with a 29:30 provisional time. After qualifying, the runner then has to place in the top-10 of the regional meet in order to advance. Everyone expects Jenkins and Cheserek to be at nationals because they do not have to pressure themselves early in the season to accomplish it. Moreover, Powell will prevent his star runners from working overtime and risk injury. Oregon’s next meet will be at Hayward Field, where they will go against Washington and Kentucky. The meet starts at 1:50 pm this Saturday — April 11 — and will be televised on the PAC-12 Network.